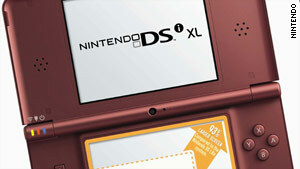 Nintendo says a new 3-D handheld console will succeed its DSi XL gaming device, above. (CNN) -- The 3-D entertainment craze continues to spread to video games. Nintendo announced Tuesday it will introduce a handheld console that plays games in 3-D without the use of special glasses. The handheld device will be called the 3DS, succeeding Nintendo's DS series of portable gaming consoles. A brief press release issued by Nintendo did not specifically state how the 3-D effect would work on the device. The console won't go on sale until June at the earliest. Nintendo said it will announce more details at the E3 trade show, to be held June 15-17 in Los Angeles, California. Tuesday's announcement marks a new direction for the Japanese-based company, which had previously been dismissive of 3-D gaming. Earlier this year, Nintendo president Satoru Iwata said, ''I have doubts whether people will be wearing glasses to play games at home. How is that going to look to other people?" The new 3DS device is expected to be backwards compatible, allowing it to play DS and DSi games. The 3DS name itself is a temporary name until the official name is revealed at the E3 convention. Gaming blogs were buzzing Tuesday with speculation about how Nintendo will achieve the 3-D affect without specialized glasses. Kotaku suggests that it may work similarly to a Japan-only game called "3D Hidden Puzzle," which uses the DSi's camera to track the movement of the player and adjust the image accordingly to make it appear 3-D.
Nintendo said the 3DS will go on sale before the company's next fiscal year ends, on March 31, 2011. Earlier this year, Sony announced a software improvement that will allow 3-D gaming on its PlayStation 3 console. And some game developers are working on techniques to show their games in 3-D on Microsoft's Xbox 360 device and on PCs. All those systems will require the use of special glasses to achieve the 3-D effect.